Unfortunatley, most of my window regularly get hit by birds - fortunatley, deaths are rare, but this is a first - two in one go. 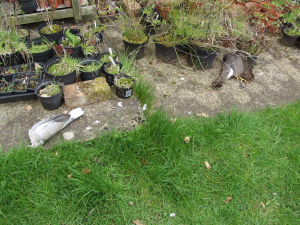 The dove was untouched by the hawk - both died due to collision with a window. The picture of the collision site of the dove shows lots of crop-milk, forced from the bird's mouth - the milk is sort of hard, yellowish flecks/small lumps of curd. The bird was obviously feeding young squabs somewhere in the conifers that surround the garden. Out of interest, I weighed them - hawk ~260g, dove ~220g.